This recording documents some work Larry Porter did with Marjorie Johnson in New York in the mid-90s. The first three tracks are art songs based on the wonderful poetry of Henry Wadsworth Longfellow. These poems are particularly suited for being put to music, but "Becalmed" stands out as one of the most eloquent descriptions of inspiration ever written. The fourth track is an improvisational piece based on the raga Marwa and demonstrates Marjorie's considerable command of the Indian vocal style as well as Larry's ability to explore the harmonic possibilities of raga on the piano. Its title, in addition to being the act of sighing, is also a variation of "Sa", the keynote of the scale in Indian solfeggio. 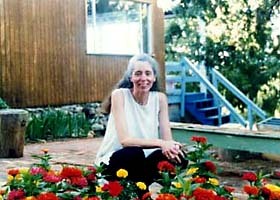 MARJORIE JOHNSON currently sings with Weave, a New York City based group exploring vocal improvisation. She has toured extensively with David Hykes and The Harmonic Choir and appears on a number of recordings. Marjorie is a practitioner of North Indian raga singing as taught by Mme. Sheila Dahr of Delhi and has performed vocally with Janaki Patrik and the Kathak Dance Ensemble. Blow, breath of inspiration, blow ! Shake and uplift this golden glow ! Its motion and its mystery !